The last few games of the current stage of the Nongshim Cup will be broadcast on the AGA’s YouTube channel Sunday and Monday nights, starting at 9:30pm PST. The Nongshim Cup is a major international championship with each country fielding a team of five players. The tournament is a “win and continue” format, where the winning player will continue to face opponents from the other countries, alternating, until only one country has any players remaining. This year, for instance, Ichiriki Ryo (right) put Japan off to a great start by winning the first three games (see GoGameGuru’s report here) Adding to the complications, the teams get to keep the order of their roster a secret: Gu Li or Choi Cheolhan will play the next player on the Japanese roster — but Japan won’t announce their next player until after Saturday’s match. “It’s a complicated format to describe, but ultimately each country is bringing their strongest players. 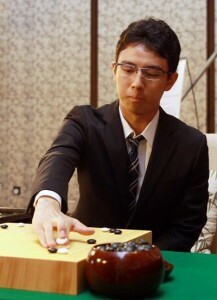 Each national organization takes this competition extremely seriously, and we should get some real fireworks,” said the AGA’s Andrew Jackson, “I’m really thrilled Myungwan Kim has been organizing these broadcasts and I’m excited to see some world-class go!” The remaining players on the Japanese side are Murakawa Daisuke, Kono Rin, and Iyama Yuta. The remaining players for China are Lian Xiao, Ke Jie, and Gu Li. Korea still has Lee Sedol, Choi Cheolhan, and Park Jungwhan.